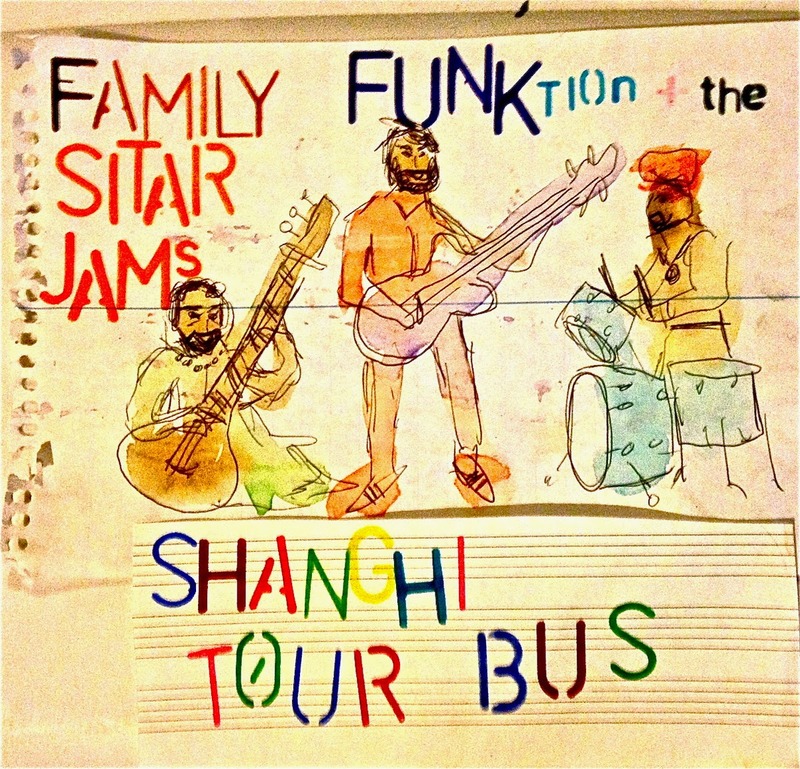 Family Funktion & The Sitar Jams is obscure without even trying. Just by its nature, a psychedelic Indian Jazz/Jam Trio has what some would consider an uphill battle towards listenership. For this writer, it was love at first listen. Discovering the band in an upstate New York venue, that had not properly promoted their presence, I was caught off guard and taken aback by what I was hearing. Fastforward to current day and once again, though I consider myself one of, if not their biggest fan, I have discovered that the trio of brothers had released an album... Last October. Yes, under the radar and over the course of a year, the album was recorded and released without even a single post on the band's social media that is typically buzzing with dates, music and info. In fact, this may be the first article calling any attention to what may be the band's greatest release to date, Shanghi Tour Bus. The album opens with my all time favorite Sitar Jams track, "Rajastanji Rumble." It begins with bending percussion, presumably from the oldest brother, Ravi Padmanabha. What follows is an explosion of sound with an outlying Indian riff from Naryan Padmanabha on the sitar. Ravi's Harmonium rings out in the background creating a resonating tone while Aneal Padmanaba smacks the bass with might. The instrumentation rounds what sounds like a corner towards the end, then enter the Sarangi. The breakdown is about as Indian as it gets and nothing short of fantastic! The contrasting "Waiting Room" begins with heavy meloncolly effects of a digital sort, letting the listener know that they shouldn't get too comfortable. A short time later following a quick musical brain surgery, "Dr's In" cuts through with a jazzy drumbeat that is followed by an effect-laden Sitar and bass from start to finish. A much more mellow composition comes next with "Cool Jam," a spacey, out there song that welcomes listeners to FFSJ's musical dream world. Towards the middle of the jam, Naryan leans on his SH-101 for some intense digital effects while the groove is kept from bursting into a million pieces by Aneal's bass. "Shanghi Delight" welcomes special guests, Steve Baczkowski, David Adamczyk and Pankaj Misra and resolves back to a much more pure traditional Indian sound. The harmonium and and Sitar intertwine before the entrance of tabla and prominent Sirangi. The result is a short, but beautiful composition. The traditional vibe continues and the guests remain for the album's title track, "Shanghi Tour Bus." There is something about the sitar and Sarangi, that when pitted against some loose jazz drumming, creates a very unique sound that I have only heard come from Sitar Jams. "Nordique Man" returns to sonic chaos with reverb and echo commanding the tone. This track, more than any others, sounds the most improvised and loose until the return to the song's signature lick. "Meet You At The Summit" enters with swagger and builds towards a metaphysical peak. Much like a story, the listener can feel the climb as facilitated by rapid tabla work, engaging sitar and sliding bass. The mid-section of the jam jumps off into blissful musical anarchy with the SH-101 making another ferocious appearence, bringing the flow to a near standstill. Space and time cease to exist as a variety of sounds collide with the listeners eardrum, before the trio begins to piece together the universe for a seamless transition into "Chilling At The Summit." The calming instrumentation meanders along, providing a near meditative musical atmosphere. Towards the middle/end, Naryan utilizes an almost Jerry Garcia like tone on the Sitar to provide a very jam-sounding section as the song approaches it conclusion and ends once again with the SH-101 dissolving into nothing. Bass, tabla and the SH-101 welcome "Kingston," an aggressive and deviant composition that is sure to bring the listener to the edge of their seat. The tension is great and the subtle release brings the groove to the forefront for some sitar noodling that remains until the track's close. The album's end result comes in the form of "Sweet Live Evil," a downtempo song that maintains a mellow output, until things get weird about two thirds of the way through. The track, and consequently the album, end with soft drumming that makes way for a couple of final sitar strikes and bass notes. The obscurity of the music is only surpassed by the hushed, lackluster release of the album nearly three and a half months ago. Though the promotional attention to the release of the album was silent, the material itself screams of originality, virtuosity and innovation. 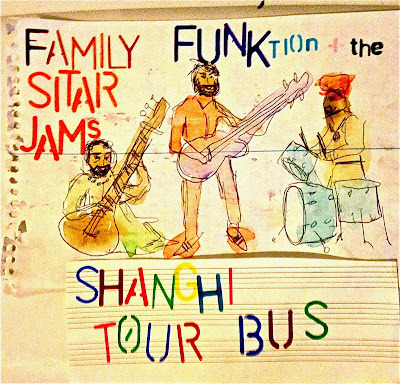 Listen to Shanghi Tour Bus in its entirety for free on Bandcamp!